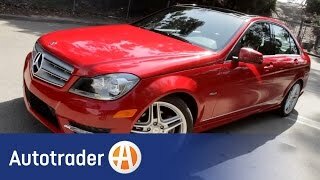 Mercedes released details about its all-new restyled 2012 C-Class Sedan which would arrive at the US dealerships in the summer of 2011. The Mercedes C-Class Sedan 2012 gets a makeover for the bumper making it more distinctive and dynamic in design. The luxurious interior emphasizes a stylish dashboard, which features a premium, fine-grain finish and stylish trim elements, as well as a high-resolution color display. Five new driver assistance systems ranging from the ATTENTION ASSIST drowsiness detection system through to the Blind Spot Assist are now available in the C-Class lineup. Do you know how the drowsiness detection system would work? Check the video after the jump. "In terms of driveline and safety systems, the new-generation C-Class offers the com- fort and safety of our luxury vehicles - and with many high-end details in the interior evocative of the new CLS, the new C-Class sets completely new benchmarks in its segment when it comes to premium look-and-feel," says Dr. Joachim Schmidt, Execu- tive Vice President Sales & Marketing Mercedes-Benz Cars. This interior upgrade is further enhanced by the latest generation of telematics, which not only features com- pletely new visuals, but also brings improved functionality. A total of more than 2,000 new parts distinguish the newest generation of the Mer- cedes-Benz C-Class from its predecessor. The U.S. market introduction is scheduled for summer 2011 (available to order in Europe as of January 2011). Alongside the generous standard equipment, the Sport and Luxury versions of the new C-Class form the basis of the individualization program, with both lines now more clearly dif- ferentiated from each other. The bumper now has a more distinctive and dynamic design, with the front end adopting the brand's new design language. The central element of the front end is the grille, which is further enhanced by the new bumper design. The center air intake opens upward in a v-shape and forms the core element of the grille design. Distinc- tive lines emerge from the base of the aggressive arrow design in the center. Running beneath the headlamps, these character lines transition into the side profile. The out- board air intakes in the bumper are positioned very low down to give the car a more muscular stance. The C-Class features a new aluminum hood, which contributes to weight reduc- tion and consequently to improved fuel efficiency. Contours around the head- lamps and grille bring additional emphasis to the front-end arrow form. Working together with the redesigned headlamps, the overall front-end look is far more distinctive. The available bi-xenon headlamps come with active functions and bring added depth to the appearance with a series of LED modules. A C-shaped positioning light defines the nighttime design, with cornering lights located behind it and stretching outward to the main lamp module. At the base of the headlamps are broad horizontal LED in- dicator units. Also horizontal are the LED daytime running lights located in the bumper, which make the C-Class unmistakable from a distance. On the rear bumper, the character lines and shutlines have been modified to add em- phasis to the vehicle's stance. This is especially evident in the steep rise of the char- acter line running outward toward the rear lights. A continuous character line on the upper edge of the rear bumper runs into the fenders of the C-Class to provide a con- nection to the sides and emphasizes the sporty character of the rear view. A new one- piece jewel case on the tail lights provides further integration into the rear of the ve- hicle. The characteristic sinuous surface line is now reflected on the inside of the lights and is reminiscent of earlier models. The distinctive depth of the lights are achieved by LED indicators located in the center that appear to float in front of the more deeply set red LED bands above and below. The rear light pattern is particularly distinctive at night. One focal point of the work done in the interior was the redesign of the dashboard with the aim of creating a powerful, sporty and premium look-and-feel that in- cludes extensive enhancement to the trim. The surfaces of the controls are more finely detailed and feature a metallic finish. The stepped hood of the instrument binnacle now extends to incorporate the central display and runs onward into the passenger side enhanced by a subtle character line. The central, trapezoidal air vents and the outer circular vents are accentuated with metallic trim elements. Central to the design of the new dashboard is a prominent trim panel. This ele- ment stretches from the central air vents along the passenger side to the outer air vent, adding visual width to the interior. The surface grain on the top portion of the dashboard continues along the upper edges of the door panels. The new-generation center console is distinguished by its rectangular silver keys and emphasizes the premium feel of the interior in combination with matte keys, high-gloss surfaces and a new knurled control knob. Together with the new- generation telematics, the restyled C-Class also receives a new instrument binna- cle with integrated display. Oriented toward the driver are three tubular gauge surrounds with metallic surfaces that further enhance the aggressive character of the C-Class. The luxury feel is emphasized by the new-generation leather steering wheel intro- duced with the all-new CLS and now available as standard in the C-Class. The steer- ing wheel features a chrome-plated central spoke and further accentuates the car's stylish and sporty ambience. Fuel economy has been improved by up to 15 percent. All new direct-injection ver- sions feature exceptional efficiency and environmentally-friendly fuel consumption. All models also come with the redesigned seven-speed automatic transmission, with the gear ratios on all versions optimized for fuel economy. 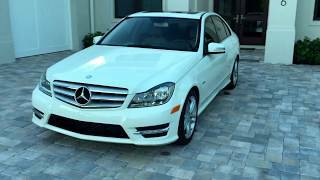 The highlight in the engine lineup is the introduction of the new V6 gasoline engine in the C350 Sport Sedan, featuring the innovative and highly efficient BlueDIRECT process. The improvement in efficiency is combined with a considerable increase in output. The C350 Sport Sedan now generates 302 hp and 273 lb-ft of torque (previ- ously 268 hp and 258 lb-ft), while fuel economy has been improved by 5 percent compared with the outgoing C350 model. The four-cylinder engine (new for the U.S. market) features direct injection and tur- bocharging and is also distinguished by outstanding combined fuel economy of 24 mpg. 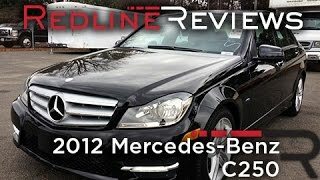 This marks an improvement of nearly 15 percent compared with the 2011MY C300. The C-Class attains an all-new level of safety with a total of five new driver assistance systems ranging from ATTENTION ASSIST drowsiness detection through to Blind Spot Assist. The assistance systems are based on state-of-the-art radar, camera and sensor technology and are setup to react to frequent causes of accidents such as prox- imity to the vehicle in front, fatigue and darkness. The new C-Class sees the debut of a new generation of telematics, which is scheduled for successive introduction across further model ranges. Key new features include improved user-friendliness with larger 3-D displays, phone book transfer, text mes- sage display, wireless music via Bluetooth and a USB interface now located in the center armrest.